Our company has created the niche in the field of providing Plant Machinery Shifting to the clients. This Machinery Shifting Service is completely consistent and completed with the team of hard-working professionals. This service is well renowned in the market for its reliability, timeliness, flexibility and cost-effectiveness. To provide trained personnel, the most updated specialized equipment, Professional machinery moving and rigging services for the installation and relocation of industrial equipment. Shifting an office could turn out to be a project in itself - when you try to do it yourself. When you outsource this job to us, the project simply becomes a task in your to-do list that you just have to check off when we say ‘We’re done, boss!’. Corporate relocation on our extensive experience and enormous expertise in this relevant field, we are distinguished as one of the most prominent corporate relocation service providers in the market. 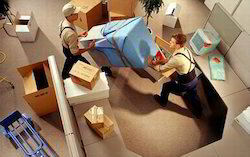 In this service, we help big corporate houses in relocation and shifting of their establishment to a new place. Our company propose the complete corporate relocation that includes office relocation including elimination and installation of systems, relocation of industrial equipments, machineries files, furniture, fixtures, documents, computers, cabinets, vehicles both two wheelers and four wheelers and more to their preferred location..
We have moved entire multiple floors of CBD buildings (sometimes completing large office relocations over night) using our hourly rate system. Corporate Relocation is most challenging service in the Packing and Moving service, The Corporate Relocation has to be analysed by an Packing and Moving Expert, then report to be arrived, fix the day and then shift. The process may look simple and easy, but it requires lot of experience in moving the corporate. If you run an office in then city, and you have to shift it to another city, it is going to be quite a big headache. Even thinking of it can give you sleepless nights. You might find it hard to sleep for a fortnight if you are not sure of help at this end. Rajdhani Cargo Packers and Movers Company is committed to the success of our corporate clients' relocation programs. The relocation industry changes quickly and we work diligently to ensure that our services and programs reflect the needs of today's relocation reality. We know and understand that our solutions helps to your company meet its goals.